Captain America: Steve Rogers was injected with the super-soldier formula to become the US military's secret weapon in World War II. Frozen in ice following a fall into arctic waters, Cap was found years later by the Avengers. 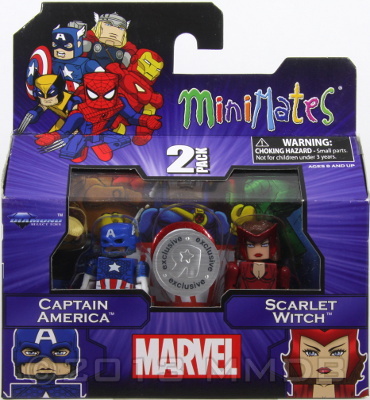 Scarlet Witch: Wanda Maximoff is the daughter of the mutant Magneto and a long standing member of the Avengers. Her mutant power to affect probabilities is heightened by Chaos Magic, with often unpredictable results.